Everyone knows to be careful of scammers when shopping on Craigslist (actually everyone doesn’t know that, but they should). And lots of people are aware of potential scams on eBay, since just about anyone can sign up as an eBay seller. But Amazon – now that’s a place with a great reputation for excellent customer service, so it must always be a safe place to shop, right? Not always. The product being offered for the stated price is a legitimate product that will be shipped to you after you purchase it. If there are any problems or you are not satisfied, Amazon’s great customer service will immediately take care of the problem – usually with a refund. And there’s a good reason why most people assume those two things; because that’s what usually happens. But there are some Amazon shoppers who are waking up to the surprising fact that things don’t always go that way. In a lot of ways, Amazon is kind of like eBay. Anyone can sign up to be a seller on Amazon. Just like anyone can sign up to sell on eBay. And since anyone can do it, there are scammers that create Amazon seller accounts just for the purpose of defrauding buyers. 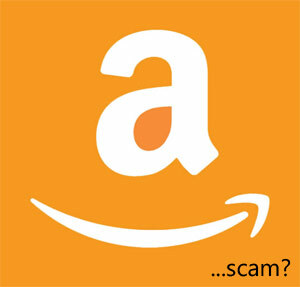 Mr. Scammer signs up to be an Amazon seller. He creates a new listing page where he is selling iPhone 8 smartphones for $699. Personally, I don’t use an iPhone, but for anyone who’s shopping for a new iPhone, that’s an amazing bargain (if it were genuine). So someone shopping for a phone finds that deal and immediately plunk down a credit card and makes the purchase, thinking they just got the deal of a lifetime. A day or two later, the buyer gets a notification from Amazon that the item has been delivered. But the buyer is confused, because nothing has been received. Check the front porch, check the mailbox, nothing there. But Amazon’s notice says it was delivered by Fedex – it even says someone signed for it. Huh? So the buyer goes to the Fedex website, with the tracking number. Sure enough, Fedex says the package was delivered and signed for right on time. But when the buyer checks more closely, he sees that the package was in fact delivered – just to a different address in the same city. In fact, it went to a business address. So someone from that business signed for it. And that’s what makes this scam work – when Fedex tells Amazon that the package has been delivered, they don’t tell Amazon what ADDRESS it was delivered to. All Amazon knows is that the package was shipped, and Fedex confirms that it was delivered. But when the buyer contacts Amazon to explain the problem, Amazon will just immediately refund, correct? No, they probably won’t. From their standpoint, your purchase was delivered (even though they don’t know where it was actually delivered to). So the scammer keeps the money and you have nothing. Some buyers who have been scammed this way have actually gone to the business where the package was delivered. Of course, the employees who work there are completely confused because Fedex brought them a package and had them sign for it, but the box was just empty with no contact information. So it doesn’t really help to go there to try to track it down. This is a growing problem, so I’m sure Amazon will figure out a way to keep it from happening. One clue obviously is the address for the delivery, but another suspicious factor is the weight of the package. An iPhone and accessories should obviously weigh more than an empty box. But at the moment, Amazon is usually siding with the seller since it looks like everything went as planned, from their perspective. How can you avoid this scam? First, if an item is obviously WAY underpriced, that should raise a red flag. Yes, Amazon does have some bargains sometimes and items can be sale priced to clear out inventory from time to time. But the iPhone is one of the most in-demand products in the world, so seeing it priced substantially lower than the norm should tell you something. Second, check on the seller. If the seller is brand new and has a bunch of products listed that are too-good-to-be-true bargains, just keep looking. It’s tempting to buy anyway even if you’re suspicious, but just know that you might be throwing money away. Don’t be a victim. Great advice Scott but if I may add something. Look at the customer ratings for the company too. I never buy anything from a third party on Amazon unless they have an excellent rating and in doing this, I’ve never had a problem. Another safety feature. I only buy Prime items. Also, not only do I look at the ratings and comments but how many are “verified purchasers” and how many in total have commented. If it’s only 4 or 5 I’ll usually skip it if it’s an expensive item.